Including large-headed Roses, Germini, Oriental Lilies, Spray Chrysanthemums and Lisianthus and finished with curved Steel grass, this contemporary design in fresh white will be expertly created by your local Interflora florist.Delivered in a cream, ceramic container our Exquisite Arrangement is ready to display instantly. 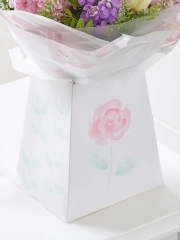 A traditional trug basket filled with roses, veronica, statice and scented freesias in pinks and lilacs.Please Note:The image relates to the large variant. Aberdeen Flowers are able to provide flowers for the sadder times. Our expert florists will handle everything with the care it deserves. Aberdeen Flowers have a dedicated florist for sympathy flowers who will be able to advise on what gift may be best or appropriate to the occasion. Our advice would be to think of the best gift to help through this difficult time. Flowers are a good choice as it can bring a bit of brightness in hard times. We would recommend flowers that are perhaps already arranged in a nice basket which would need minimal care. No need to worry about the flowers changing them into a vase the flowers will be arranged beautifully in a basket. Our Aberdeen Florists arrange every arrangement to order so you can rest assured that your flowers will be beautiful on arrival and will be fresh so will last longer. We guarantee the freshness of our flowers by importing them directly from Holland so that we know everything we make is composed of only the highest quality flowers. Aberdeen Flowers offer a delivery service that can bring your Sympathy flowers anywhere you would like in the North East, as well as further afield in the rest of the UK and 140 other countries which we achieve through a network of trusted florists worldwide. Aberdeen Florists offer same day delivery on orders placed by 3pm to allow us the time we need to ensure that your flowers are perfect. All of our Aberdeen Flowers drivers take the greatest care in delivering your flowers because we know that you want them to arrive on time and in the best condition possible. 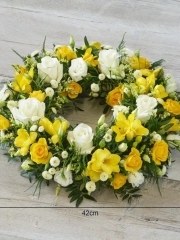 We have a very wide selection of flowers here at Aberdeen Flowers so there is guaranteed to be something that will be tasteful and appropriate for this sad time. You can choose all the details of your order thanks to our Aberdeen Flowers bespoke service. Alternatively you can leave these decisions up to our expert Aberdeen Florists who will create something beautiful with you in mind. We want you to know that when you choose Aberdeen Flowers for your flower arrangement needs you will receive the best service because our first priority is always customer satisfaction. Our Aberdeen Florists will make sure that your flowers are beautiful and appropriate for the occasion and we will deliver them wherever you like so that you do not have to be concerned with anything once you place your order since Aberdeen Flowers will take care of everything for you and deliver on your behalf. We have funeral tributes as well which you can browse on our Funeral Flowers Aberdeen page. Please feel free to contact Aberdeen Flowers at any time over the phone, online or in person in our shop in Aberdeen. One of our Aberdeen Florists will be happy to discuss the best flowers and arrangements for your occasion and help you choose something appropriate for this sad time. Having been established for over 40 years we have a vast wealth of experience in dealing with the more difficult times and our expert florists will be able to help you with whatever you require in terms of sympathy flowers.